Jakob Chychrun is an unwavering two-way defenseman who currently patrols the blue line as the alternate captain for the Sarnia Sting of the Ontario Hockey League. The 6’2”, 200lb phenom was born on March 31, 1998 in Boca Raton, Florida, and is ranked fourth among all North American skaters. Chychrun is a skilled defender who uses his size, along with poise and composure, to direct the puck up-ice. He also possesses a powerful left-handed shot that dominates the power play and forecheck. He has excellent hockey sense and vision on the ice, which keeps him steps ahead of his opponent. After being picked first overall by the Sarnia Sting in the 2014 OHL Priority Selection, Chychrun ranked second in scoring among rookie defensemen. After his success during his first OHL season, he was awarded First All-Rookie Team and Third All-Star Team honors. He had quickly become a stand-out star, and attests to being propelled toward greatness by watching other rookie defensemen progress. According to Chychrun, young skaters like Shayne Gostisbehere of the Philadelphia Flyers are an inspiration. “I watched a lot of him last season, and he’s done amazing things. 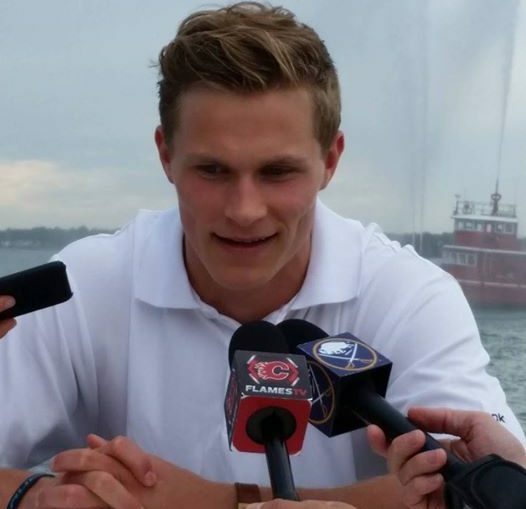 I hope to be like that early in my career,” says Chychrun. Chychrun follows in the footsteps of his father, Jeff Chychrun, who played two-hundred sixty-two career NHL games as a defenseman with the Philadelphia Flyers, Los Angeles Kings, Pittsburgh Penguins, and Edmonton Oilers; and in his uncle Luke Richardson’s path, who played defense for one-thousand four-hundred seventeen career NHL games with the Toronto Maple Leafs, Edmonton Oilers, Philadelphia Flyers, Columbus Blue Jackets, Tampa Bay Lightening, and Ottawa Senators. While he was born with the love of hockey in his blood, Chychrun assures fans that he is his own person and with his own individual skills. “I want to be different. I want to stand out. I’m excited to start my own career,” he claims through a confident smile. Chychrun competes with professional-level drive and determination, making him one of the top prospects of the 2016 NHL Entry Draft. He is a complete athlete, transitional skater, and instinctual player who will bring spark to today’s National Hockey League.